How Do I Measure For A Replacement Spa Cover? Home » How Do I Measure For A Replacement Spa Cover? When measuring your spa for a new spa/hot tub cover, there is one important thing to remember: IT HAS TO BE LARGE ENOUGH TO FIT! We can make you a cover in one of two styles. The most popular style is to cover only the acrylic shell. (measurement C in the below diagram). 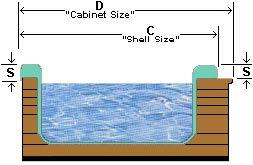 If you have a spa/hot tub that resembles the diagram below, with a wood edge on the outside of the acrylic shell, and would like your new lid to cover both the shell and the wood lip, MEASURE FROM THE OUTSIDE OF THE WOOD SKIRT (D “Cabinet Size”). There is no difference in spa/hot tub cover performance either way. It is simply your preference. A – This is the height of the acrylic lip. This will determine the cover´s skirt length (“Cabinet Size” covers may require a longer skirt, to the bottom of the “deck”). B – Width of wood lip of the cabinet (not present on all tubs). C – Outside dimension of the acrylic shell (standard cover size). D – Outside dimension of the wood cabinet. lines start where the cover begins to curve, and end where they cross. 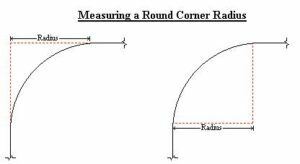 Be sure to measure all corners and that they are ALL the same size! 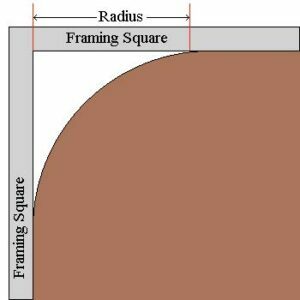 IMPORTANT: If in doubt, a slightly smaller radius will slightly over hang the spa while a larger radius will not cover the spa completely. Some covers have cut-corners. 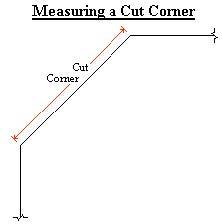 The diagram above shows a cut corner with the length of the redline representing the measurement of the cut-corner. Be sure to measure all corners and that they are ALL the same size (some covers have different cuts)! IMPORTANT: If in doubt, a slightly smaller cut-corner will cause the cover to slightly over hang the spa while a larger cut will not cover the spa completely. The example above shows an octagon (eight sides). Its length & width measurements (9 & 10), and the side measurements (1-8), are ALL EQUAL. 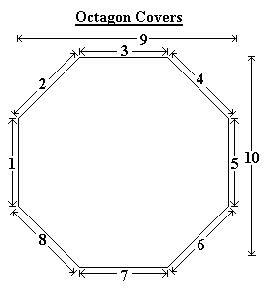 If they are not equal, it is not a true octagon, but more than likely a cover with cut corners. Measure both your spa and your old cover, if possible. Make sure the measurements are big enough. It is okay for the cover to be big. It still does its job. However, a cover too small will never do the job it is supposed to. Measure all sides of the spa. Measure the overall length and width of the spa. Be careful when representing the dimensions in our order forms.